These winged wonders are found in the Western Hemisphere, and there are a lot of them, more than 325 species. Most are in the Southern United States, except those that see fit to migrate to parts far away. They have a range of sizes, such as the bee hummingbird that's, well, about the size of a bee. There's also the giant hummingbird ("giant" being a relative term), 9.1 inches (23 cm). Here's something I won't leave alone: if you have a hummingbird feeder, clean it often so you don't end up poisoning them (and don't use bleach! ), you savvy? Creationists like hummingbirds. Not just because they're amazing, but also because they fustigate evolution. (Darwinists cannot explain their intricate specified complexity, and have to resort to the mysterium tremendum of evolution: they don't know how, but they evolved.) These little critters can move mighty fast when they want to, and have an extremely fast metabolism that needs frequent refueling. One of the main puzzlers about them is their aerobatics. They can not only do basic flying, but hover, move backwards, fly upside down, and do other feats. How? Special wing movements and air currents that scientists cannot quite explain. The hummingbird may be one of the most well-known birds on earth, yet this colorful acrobat continues to mystify the greatest mathematicians and aeronautical engineers. Just when they think they’ve learned all there is to learn about these birds, they discover more. To read the rest or download the audio version (by my favorite narrator), click on "Hummingbirds—Avian Acrobats of the Americas". 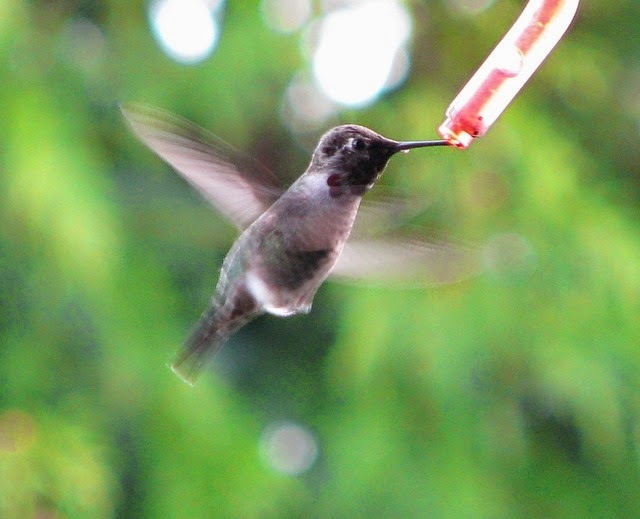 Two other items of interest, "Hummingbirds Fly in the Face of Evolution" (which has an interesting video at the bottom) and "Flighty Evolutionary Speculations Taint Hummingbird Taste Study".